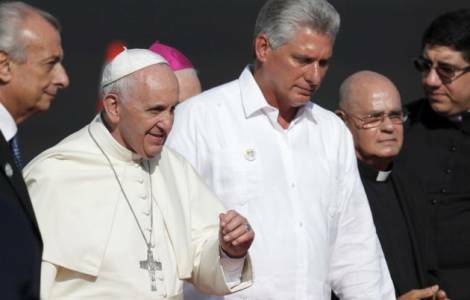 Havana (Agenzia Fides) - "Nobody expects a substantial political change with the election of Miguel Díaz-Canel as new Cuban president", comments María C. López, responsible for the communication of the Archdiocese of Santiago de Cuba, to Agenzia Fides. "If anything, the most significant change is the presence of three out of five women in the group of vice-presidents", in a State Council that retains only two "historical" leaders out of a total of 30 members. Díaz-Canel was elected on April 17 by the National Assembly of People's Power (unicameral Parliament) as president of the State Councils and Ministers. His term will last five years. In his speech, he reassured the establishment: "I have not come to promise anything. I have come to complete the program that we dictated, with the features of Socialism and the Revolution". He further clarified: "There will be no room for those who aspire to a capitalist restoration". Díaz-Canel is the first post-castrism leader of the nation (although Raúl will be First Secretary of the Communist Party of Cuba until 2021) and the first head of State to be born after the arrival of the "barbudos" of the Sierra Maestra, 8 January 1959. The Catholics of the island, like the majority of the population, welcomed the news with indifference. Journalist Yoani Sánchez wrote that the reasons for this attitude are due to "the bad economic situation, the pessimism that arises from the belief that nothing will change only with a new face, and the fact that the people do not know other scenarios". The Catholic Church will maintain openness to dialogue that characterized above all the Raúl era. "In almost the 11 years in which Fidel Castro's brother was in power", recalls Maria López speaking to Fides, "there were meetings between the State and the Church, with various moments of exchange between their respective leaders, which became concrete and visible with the release of a large number of prisoners from 2010, especially those of the so-called Spring of 2013, and with the visits of the Popes Benedict XVI (2012) and Francis in (2015)".